The NLE Requirements for first timers and retakers and also the application filing at PRC are detailed below. Each year, tens of thousands of nursing graduates are taking the nursing board exam and not even half of it have made it successfully. In the first batch in June this year, there are only 16,219 passers out of 37,887 examinees (42%). e. “FOR BOARD EXAMINATION PURPOSES ONLY” remarks. 1. Secure Nurses’ Application Form (NAF) at the Information Desk. Or you can download it here. 7. Return to PRC 2-3 days before the exam date for verification of school/building/room assignment. There will be NO EXTENSION of the deadline. All applicants are enjoined to file early to avoid overcrowding and long queues. Only those with complete and appropriate documents will be accommodated. For faster NLE application, you can do it online using PRC Online Application System here. 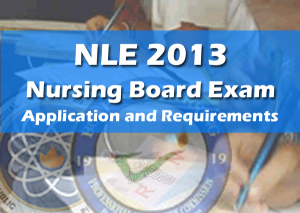 For more nursing board exam updates, subscribe to this blog via email. Good Day!!! Totoo poh ba na tatlong beses ka nlng pwedeng mgretake ng nle??? pero still not sure. sabi lang ng parents ko na thats how it works pero hindi sila nursing related jobs. baka sources lang nila or gossip. still correct me if im wrong. My name is victor yakubu am from bayelsa state i was among the successful candidates that wrote the NAF exam in the year 2015, i am so happy as this was my fourth time of writing it and all my appreciation goes to Major General Ahmed Mohammed for his assistance i am very happy that few months from now i will be a member of NAF. if your name is still not out yet, i will advice you contact him to help you before the last list is out and it is only few names that will be released so hurry up and here is Air Vice Marshal Sadique Baba Abubakar number 08144702657. 08077687246. Good evening sir/maam. I graduated College of Nursing since 2012. May I ask if you accept the OR and DR longforms and also Summary of RLE that valid until December 2012. It is my first time to take a board exam. May I ask advices about this. Thank you. God bless. Hi… I’m Paula batch 2007… Pwde po b mag apply online for retakers..? Nsa Singapore po kc ako nag work.. Ano po bang Bago ngaun kc mtagal n po ako d nka pag take Ng board exam… Thanks! Ilan beses po ba pwede magretake nang board. ask ko lang po if may extension pa pu ba ang November 2016 exam? thank you po. Hello, I’m from batch 2009 at balak kopo sana mag rwtake ng board? Pwede pa po ba or need ko ng refresher course? May limit napo ba pagtake ng board? 3 besea napo ako nagtke pero dpa rin kasi ako pumapasa. Ittry kopo sana ngayon baka sakali palari ako. Hi I’m also batch 2009, and planning to take the board exam this year. I just don’t know if there are other requirements coming from our schools that needs to be take or we could directly file at PRC. Did you pass na NLE? I’m Batch 2009 too. Planning to retake this year. Hi Claudette parehas tayo 2009, ngtake ako last june 2009 sa baguio bka this november ka din magtatake. dito kalang ba sa manila? nakakatamad kasi pag walang kasama, dami kong katanungan na PRC lang talga makakasagot. nawala NOA ko tagal n kc . at di ko sure kung pede pa ako or need ng refresher baka may nahagilap ka ng info. hoping for your reply thanks. Everything is in His timetable. Maybe it’s our time this year. So cheer up! ask ko lang first time kong magti take ng board exam pano po ba ang.format ng DR at OR cases para makapag file po ako.i graduated 1998 pa.
As long as it its signed and notarized then it will be valid. As i know the format of cases will not be change to the latest form since yours is 2005 format. Hi, nakapagtake kanaba?, 2009 last take ko sa bagiuo , gusto ko rin magtake ulit ngaung novermber 2018, not sure kung pano gagawin nawala din ung NOA ko tagal na kc. baka mabigyan mo ko ng tips kung pano. thanks hoping for your reply. Hi. 2008 po me nag graduate at di po nakapasa. Still want to try for the 2nd time. Puwede pa po ba? At kung sakali ano po gagawin? Thank you po. Hi, 2005 pa ako graduate puede pa ba ako take NLE? Nag ka problema kasi ako noon sa nso birth certificate ko, kaya d ako naka take ng exam. Hi. 2005 pa ako graduate, puede pa ba ako makatake ng NLE?